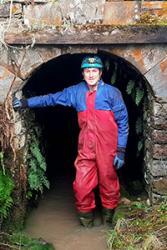 Ioan LordA Bangor University student has launched a book about mines in Cwm Rheidol and Ystumtuen after starting work on it when he was just eight years old. Ioan Lord, 20, from Cwm Rheidiol near Aberystwyth, is studying Welsh History, finished the book, ‘Rich Mountains of Lead’: The Metal Mining Industry of Cwm Rheidol and Ystumtuen, last year. 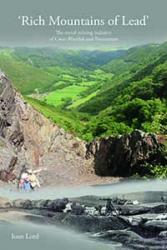 Ioan’s book looks in detail at the history of the lead, silver and zinc mines of Cwm Rheidol and Ystumtuen. It studies the rise and fall of the mining industry in this often-forgotten part of the Central Wales Orefield. The book contains the individual histories of each mine site in Cwm Rheidol and Ystumtuen as well as modern day examinations and groundbreaking underground surveys; sites which all contributed to forming one of the largest and most important industries which Ceredigion ever had. Ioan has been studying and exploring the old abandoned mines around Aberystwyth since the age of 6, and started to write this book when he was only 8. A decade of further research and with the support of the Vale of Rheidol Railway who have published this unique academic book, Ioan has finally achieved his childhood dream. His book breaks new ground in exploring not only the history of an industrial valley which has never before been studied in detail, but also the lives and legacies of hundreds of men, women and children whose lives revolved around the mining industry. When not working as a Guard and locomotive Fireman on the Vale of Rheidol Railway, Ioan volunteers in curating and exhibiting industrial museums at Corris and the Llywernog Silver-lead Mine at Ponterwyd. ‘Rich Mountains of Lead’: The Metal Mining Industry of Cwm Rheidol and Ystumtuen.This book is the culmination of many years of archival research, archaeology and underground digs and explorations which tie in the history with some fascinating discoveries recently made hundreds of feet below the earth in Cwm Rheidol and Ystumtuen. It brings together a vast archive of old photographs and documents, maps and books which date back as far as 1670. It demonstrates the local and national importance of a 4,000-year-old industry, which deserves a much higher recognition and value. Ioan's book is currently available exclusively through the Vale of Rheidiol Railway Shop. If you would like a copy, you can buy it through their ebay store or call 01970 625829 to secure your copy.